AS Roma is a storied club with a pair of living legends, but it has ambitions to be internationally recognized and a world power on and off the field. Change is coming to the Eternal City. To walk through Rome is to feel the tangible tug of history. Each year, millions of tourists visit the ancient city on the Tiber and hope to soak in that sensation as they stroll down Via del Corso, explore the Forum or climb the Palatine Hill. To be from Rome, however, is no holiday. To be Roman is to feel that history flow through your veins and seize your heart. A Roman is boosted and burdened by the deep roots beneath his feet and by the high standards set by his forebears. It's inspiring and exhausting to be Roman. Baldissoni, 46, is a Roman, an attorney and the general manager of AS Roma, the soccer club that wears the traditional red and gold of the empire. Like so many Romans, he’s been supporting the Giallorossi for as long as he can remember. It’s a birthright and a responsibility. He attended games at the Stadio Olimpico long before he imagined working for the tenant. And he recalls spending Sunday afternoons at his grandparents’ house when Roma was on the road, eating lunch and then rushing to the TV as a presenter listening to the match on radio offered rudimentary play-by-play. “Going around the city, you can feel the same sense of triumph the emperors who built the world were feeling. It means something special,” Baldissoni said. More modern triumphs are celebrated at the Circus Maximus, the famous stadium and race track at the base of the Palatine. It’s now a grassy infield and public park. Thousands gathered there in 2006 when Italy won the World Cup, and they were there five years earlier as Roma clinched its third Serie A crown. But the local club has yet to win a fourth. Like everything in Rome, the wait feels like it's lasting forever. In the ensuing 15 years, while northern powers AC Milan, Inter Milan and Juventus stockpiled Scudetti and enjoyed deep Champions League runs (and three titles), Roma drifted. Two Coppa Italia wins haven’t allayed the frustration of eight runner-up finishes in Serie A and a failure to progress beyond the Champions League quarterfinals. It’s been a long time since Rome conquered the world. It translates roughly to “Why couldn’t I be born in another city,” and for Daniele De Rossi, it’s a rhetorical question encapsulating the price exacted by a Roman’s deep devotion to his hometown. “Everyone was born with this passion—with this fate,” De Rossi said. He should know. His father, Alberto De Rossi, played professionally and has spent the past nine seasons coaching Roma’s Primavera (U-19) team. Daniele was in the ASR system at age 12. He debuted with the senior squad in 2001 and has become one of Europe’s most consistent and effective defensive midfielders. Now 33, he’s approaching 400 appearances with the Giallorossi and has surpassed 100 for his country. A decade ago, he was a World Cup winner and several times since, he’s been wooed by clubs that don’t wait 15 years for a championship. Baldissoni said that Manchester United expressed its interest just a couple years ago. Real Madrid and Chelsea inquired before that. De Rossi admitted that during the spring, he occasionally catches himself wondering what might have been while watching the Champions League’s later rounds. Speaking to SI.com, he counted off the number of showpiece games he might have played and the medals he could have won. “That passes through my mind. But it’s something I chose long ago,” he said. “It’s all about that [question]. Sometimes on my couch I think, ‘If I were not born in Rome, I would never be a Roma fan. I would never feel this sort of owed, this duty, to my fans, to my people, to my city.’ For me, a good player, it could be easier for sure. But the other side of the coin is that I loved to stay here. I love to [make] my people happy—for only one match, for only three matches. I love to see them happy. De Rossi is entering the final season of his current contract. He would love to win the Scudetto with Roma, but he knows there’s more career behind him than ahead. The keys to the Giallorossi midfield soon will belong to Radja Nainggolan, if they don’t already, and De Rossi now can see both sides of that aforementioned coin. There are permutations to consider. He said his wife Sarah’s father is from the U.S. De Rossi is fascinated by American culture and confirmed that he speaks frequently with Andrea Pirlo, who’s in his second season at New York City FC. Maybe MLS awaits. De Rossi also wants to play in the 2018 World Cup, and that may mean staying in Serie A. As he considers his options, he knows one thing for certain: "The one feeling bigger than the pride you feel when you play for Rome is the sadness you feel without Rome." There are tough decisions to come. But at the moment, the most significant factor for De Rossi, the team and the city itself is the future of Roma’s other one-club man. If De Rossi finally leaves the capital, the timing must be right. And like everyone else in Rome, he defers to Francesco Totti. “It wouldn’t be right toward the fans for me to leave as well, in the same year,” De Rossi said. Rome hasn’t had an emperor in 1,500 years. But in 2016, it still has a king. He is “Il Re di Roma,” the flesh and blood manifestation of the commitment and continuity that define the city. Totti grew up a short walk from the Colosseum and idolized ASR captain Giuseppe Giannini, who scored the only goal when Italy defeated the USA, 1-0, in a 1990 World Cup game at the Olimpico. He was known, appropriately, as “Il Principe,” or “The Prince.” Then Giannini, a Rome native, left for Austria in 1996. He made way for the king. Totti, a playmaker-turned-forward who will be 40 next month, is as close to forever as a footballer can be. Reportedly a seventh-generation Roman, he made his debut with ASR’s senior side in the spring of 1993, meaning his career is about as old as some of his teammates. He tallied 13 Serie A goals during the 2000-01 championship campaign, started for Italy’s World Cup-winning squad five years later and hit double-digits in all competitions as recently as 2014-15. He’s the second all-time leading scorer in Serie A history and ranks third in appearances. This is almost certainly Totti’s final season in uniform, yet he recently signed a six-year deal to remain with the club in another capacity. He’s the captain, an institution, and he’s not going anywhere. ‘Sun’ also might have been appropriate. The legs give out before the heart. Totti said he felt “up to it” ahead of his 25th season. It’s easy to imagine that the club’s 14-0-3 run to close 2015-16—which left it trailing Juventus by nine points and had many wondering what might have been if manager Luciano Spalletti had replaced Rudi Garcia before January—has Totti feeling optimistic. In addition to the 2001 title, he’s claimed two Coppa Italia and two Supercoppa Italiana crowns with Roma. It’s a scant haul for a long-time linchpin at a larger club and like De Rossi, Totti knows he’d have won more elsewhere. Unless it happens this season–and right now the odds appear to favor a Juventus Serie A six-peat–Totti will be celebrating Roma’s fourth Scudetto in a team polo rather than a jersey. He’ll have contributed, however, whenever it happens. Totti, and to a lesser extent De Rossi, infused Roma with an identity during an era when global trumped local—when continental trophies, TV exposure and the accompanying rivers of revenue flowed toward a select and increasingly entrenched group of clubs. Serie A’s global broadcast rights net the 20 participating teams less than $200 million combined, a figure that Roma president Jim Pallotta called “absurd on every single level.” And ASR hasn’t consistently earned big money from the Champions League, having reached the round of 16 just twice this decade. 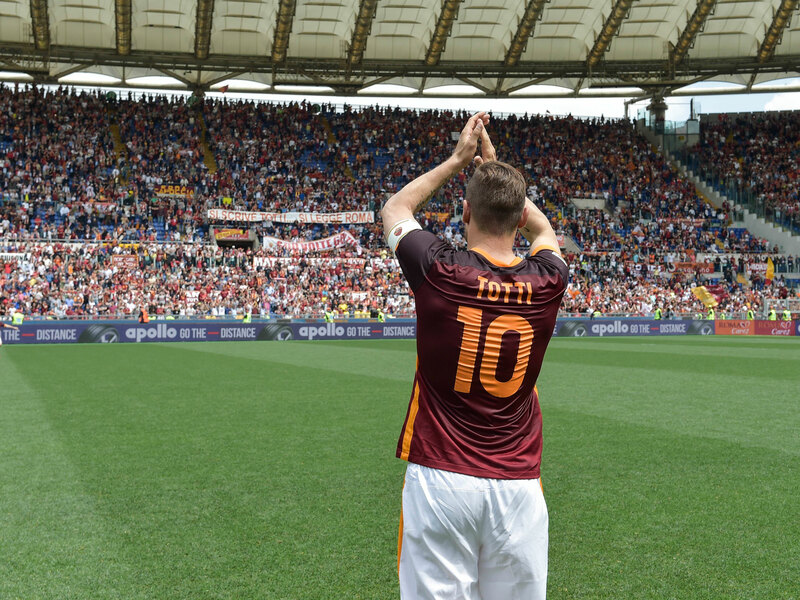 Yet thanks to what Totti called “a strong sense of belonging,” Roma has the look and feel of a big club. Roots and loyalty provide that strength. The colors and wolf crest are iconic and instantly recognizable. The Olimpico is bare bones and well past its prime, but it’s hosted a World Cup final, and when the Curva Sud is packed and the smoke and flags are billowing, it’s as festive and intimidating an atmosphere as there is in Europe. ASR is the only Italian team to draw more than 40,000 fans during each of the past three seasons, and in 2014-15 it ranked 16th on the continent in turnover, according to Deloitte’s annual Football Money League report. Granted, it trailed the likes of Real Madrid, Barcelona and Manchester United by around $380-$440 million. There’s a long way to go. But the potential is obvious. The only teams in Deloitte’s Top 20 that have been poorer than Roma in European competition benefit from the English Premier League’s TV windfall. And Pallotta thinks he’s on the cusp of building a better business and cracking that continental code. Thanks to the decades (and centuries) of constancy exemplified by its pair of one-club men, Roma has a platform and a foundation to mount its 21st century assault on world football. The passion that Totti, De Rossi and Baldissoni felt as children has been passed on, giving Pallotta the leeway to put his plan in motion. De Rossi acknowledged that he was a bit anxious in 2011 when the Sensi family, which had controlled Roma since 1993, sold out to a consortium led by American investor Thomas DiBenedetto. A year later, Pallotta, initially a minority partner, took control. An assertive and engaging Bostonian hedge fund manager with Italian parents, Pallotta was the only foreign owner in Serie A. Newcomers ignore convention. Pallotta wasn’t beholden to self-defeating traditions. Italian clubs weren’t run like businesses, and fans’ game-day experience was sorely lacking compared to their counterparts in England and Germany. Rome's ruins were in comparable shape to many football facilities and clubs. "Unless you get into the 21st century in terms of a stadium, social media, branding, sponsorships, all that type of stuff, you're never going to compete at those top levels. You're just not," Pallotta told SI.com in 2013. "I think Roma is the most undervalued sports team and brand in the world. If we do it right, Roma is worth multi-billions with the whole thing we want to put together. It's an incredible opportunity." Pallotta said he “runs Roma like a business, but I look at it as my family.” Romans won’t tolerate the former without the latter. But family doesn’t vault you past Juve and the Agnellis or Milan and the Berlusconis, not to mention the money machines at the top of La Liga or the oligarchs and monarchs who control other continental contenders. The locals will have to get used to sharing their team with the world and in return, they’ll get a sparkling new 52,500-seat stadium in Tor Di Valle, about nine miles south of the Olimpico. Pallotta said last week from his office in Boston that the club’s massive Stadio Della Roma project, which will be anchored by a privately-funded, $700 million arena and an adjacent entertainment, conference and office district, is about nine months behind where he was hoping to be. But there's been progress lately, and final approval from regional authorities is pending. If construction starts in the first quarter of 2017, Roma will be ready to move from to its new home in time for the 2019-20 season. Meanwhile, ASR is embracing its future and its past more enthusiastically. It’s time to marry mythology and modernity. 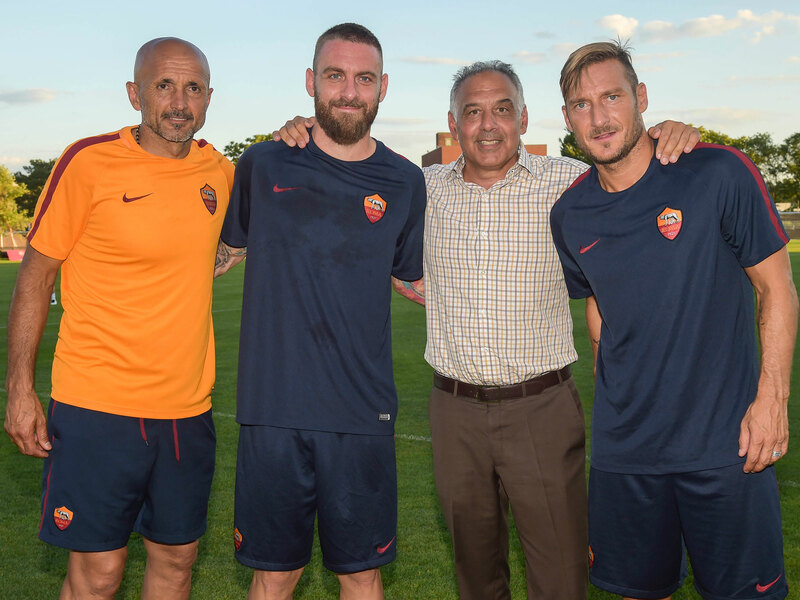 A club Hall of Fame was launched in 2012 (Giannini didn’t get in until the following year), and Baldissoni said Roma is making more of an effort to connect with former players—arranging hospitality for them at matches—while creating an archives that tells their stories. “We are now rebuilding the history in terms of artifacts, memorabilia. We collected 900 artifacts from collectors. We were able to get donated 70,000 pictures of the club from 1927 to 1998. Before we had zero pictures,” Baldissoni said. With that, and a ton of bandwidth, they’ll be armed to tell their story. And Roma has a veritable army at its disposal. There were nearly 90 staffers on the recent tour alone, many of them creating video and social media content for dissemination in 12 languages including Chinese, Arabic and Bosnian (thank Edin Džeko for the last one). In the past year and a half, Roma has launched 17 social media accounts and doubled its number of followers to more than 10.5 million. It was the first European club to stream a game on Facebook. It went to Reddit to get input from fans on a new website. It has a page just for GIFs. Of course, none of that will be worth a single goal this season and ultimately, without an improved TV deal, Roma and most of the rest of Serie A will struggle to keep up. But De Rossi understands the logic behind it. Devotion has to start somewhere and for now, absent trophies, what Roma has to pitch is the allure of the city itself—the aura that draws those millions of tourists to timeless landmarks and the pull De Rossi and Totti had no real intention of resisting. 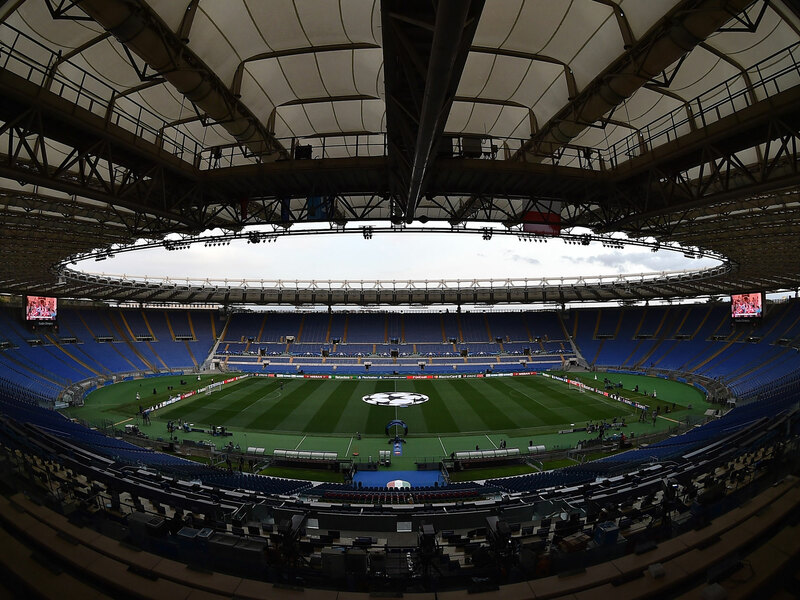 For quick revenue and exposure, there’s nothing like the Champions League, and the way Roma’s 2016-17 season is remembered will rest heavily on the outcome of its qualifying playoff against Porto. The first leg is Wednesday in Portugal and the decider is scheduled for Aug. 23 at the Olimpico. The group stage and six more games await the winner. It’s a tough test, but one Roma should expect to pass. Porto finished a distant third in the Primeira Liga last season and while ASR said goodbye to playmaker Miralem Pjanić (the Bosnian agreed to re-sign with Roma in 2014 only after a €38 million buyout clause was written into the contract—Juventus paid that fee in June), it has attacking talent in reserve in Džeko, Mohamed Salah and Stephan El Shaarawy. That bodes well for Roma’s future. At other clubs, that trajectory might not provide much solace to veterans like Totti and De Rossi, whose time will run out before the plan comes to fruition. But that doesn’t seem to be the case with the actual Totti and De Rossi. There are no regrets. They went all in to win with Roma and if they don’t, they’ll still have offered their beloved club the durability and devotion for which their city is famous. They have done their part. How the city would love to celebrate at the Circus one last time with its king. The two have an odd relationship, mirroring the duality De Rossi described when discussing the complex emotions of a Roma fan. It’s all about absolute value–the distance between zero and the agony or ecstasy the club forces you to feel. They love so much it hurts. They fight like family. One could make a case that Totti practically is a prisoner in the city he loves. But Totti doesn’t see it that way. “I’ve always said it would have been nice to be able to take a stroll through the city center and not be recognized. But the last time I tried that it was pandemonium,” he said. “In any case, I don't feel oppressed by my city. I'm just in love with its streets, monuments and neighborhoods. Ancient Roman champions performed at the Colosseum, not far from the Porta Metronia neighborhood where Totti was raised. Pallotta wondered if his captain had even been to the amphitheater as an adult. Maybe not–there hasn’t been pandemonium there in about 1,500 years. But according to Pallotta, Totti would make an exception, and a special trip, if Roma wins Serie A one more time. 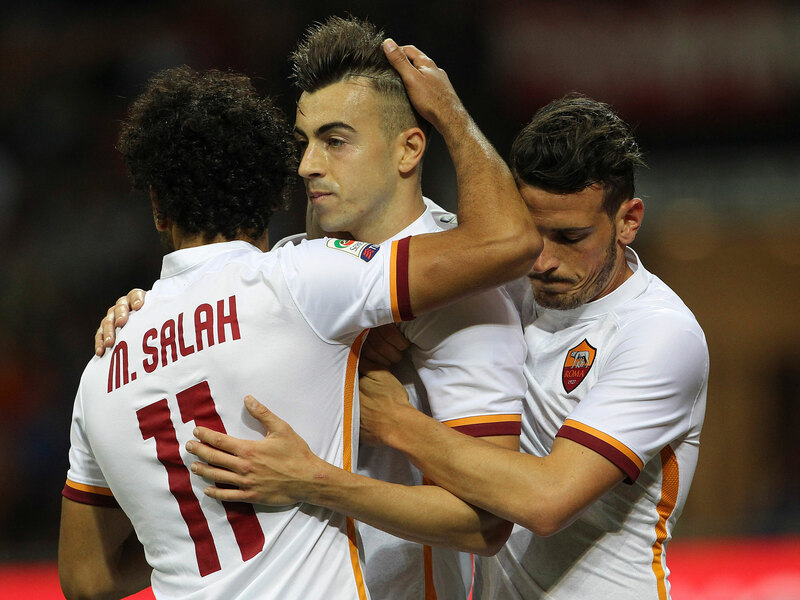 “He did tell me that when we win the Scudetto, he’ll go some morning and sneak into the Colosseum,” Pallotta said. That would be fitting—Rome’s two greatest icons, bringing history full circle.